Danny Thomas Coaching Academy owns and operate this Website. This document governs your relationship with this website. Access to and use of this Website and the products and services available through this Website (collectively, the “Services”) are subject to the following terms, conditions and notices (the “Terms of Service”). By using the Services, you are agreeing to all of the Terms of Service, as may be updated by us from time to time. You should check this page regularly to take notice of any changes we may have made to the Terms of Service. All the images contained within this website belong to Danny Thomas Coaching Academy and may not be re-produced without specific written permission. 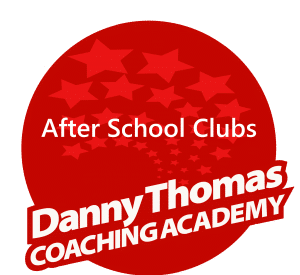 All children and adults that attend any Danny Thomas Coaching Academy session or event may opt in or out of photographs being taken during events for use on this website and social media. When booking online there is an option to say Yes or No. In the case of other activities that are not booked via this site, the option of agreeing or declining will be clearly shown on a booking form. Any parent or carer must tell us immediately if they change their mind and their child should be excluded from such publicity. You can contact us here if you do not want images reproduced of your child for use on this website and social media. You must not misuse this Website. You will not: commit or encourage a criminal offense; transmit or distribute a virus, trojan, worm, logic bomb or any other material which is malicious, technologically harmful, in breach of confidence or in any way offensive or obscene; hack into any aspect of the Service; corrupt data; cause annoyance to other users; infringe upon the rights of any other person’s proprietary rights; send any unsolicited advertising or promotional material, commonly referred to as “spam”; or attempt to affect the performance or functionality of any computer facilities of or accessed through this Website. Breaching this provision would constitute a criminal offense and we will report any such breach to the relevant law enforcement authorities and disclose your identity to them. The intellectual property rights in all software and content (including photographic images) made available to you on or through this Website remains the property of Danny Thomas Coaching Academy or its licensors and are protected by copyright laws and treaties around the world. All such rights are reserved by Danny Thomas Coaching Academy and its licensors. You may store, print and display the content supplied solely for your own personal use. You are not permitted to publish, manipulate, distribute or otherwise reproduce, in any format, any of the content or copies of the content supplied to you or which appears on this Website nor may you use any such content in connection with any business or commercial enterprise. Dispatch times (in the case of physical products) may vary according to availability and subject to any delays resulting from postal delays or force majeure for which we will not be responsible. In order to contract with us you must be over 18 years of age and possess a valid credit or debit card issued by a bank acceptable to us. Danny Thomas Coaching Academy retains the right to refuse any request made by you. If your order is accepted we will inform you by email and we will confirm the identity of the party which you have contracted with. This will usually be Danny Thomas Coaching Academy or may in some cases be a third party. Where a contract is made with a third party Danny Thomas Coaching Academy is not acting as either agent or principal and the contract is made between yourself and that third party and will be subject to the terms of sale which they supply you. When placing an order you undertake that all details you provide to us are true and accurate, that you are an authorised user of the credit or debit card used to place your order and that there are sufficient funds to cover the cost of the goods or bookings. The cost of foreign products and services may fluctuate. All prices advertised are subject to such changes. When you place an order, you will receive an acknowledgement e-mail or on-screen acknowledgment confirming receipt of your order: A contract between us will not be formed until we send you this confirmation. Only those goods listed in the confirmation e-mail sent at the time of dispatch or electronic purchase will be included in the contract formed. (c) Payment for Holiday Clubs, After School Clubs and other sport sessions where payment is made in advance to us. Upon receiving your order we carry out a standard authorisation check on your payment card to ensure there are sufficient funds to fulfil the transaction. Your card will be debited upon authorisation being received. The monies received upon the debiting of your card shall be treated as a payment against the value of the goods or services you wish to purchase and is non-refundable in the case of services such as holiday schools, events or coaching sessions. For physical products such as clothing your statutory rights are unaffected. Where pre-payment is made in advance for a period of coaching sessions either via cash or cheque these payments are non-refundable, except in the case where the Danny Thomas Coaching Academy cancel the session. For clarity, if a school makes a decision to close due to inclement weather, industrial action etc. then the Danny Thomas Coaching Academy is under no obligation to make any repayments and therefore any payments made in advance are non-refundable. The material displayed on this Website is provided without any guarantees, conditions or warranties as to its accuracy. Unless expressly stated to the contrary to the fullest extent permitted by law Danny Thomas Coaching Academy and its suppliers, content providers and advertisers hereby expressly exclude all conditions, warranties and other terms which might otherwise be implied by statute, common law or the law of equity and shall not be liable for any damages whatsoever, including but without limitation to any direct, indirect, special, consequential, punitive or incidental damages, or damages for loss of use, profits, data or other intangibles, damage to goodwill or reputation, or the cost of procurement of substitute goods and services, arising out of or related to the use, inability to use, performance or failures of this Website or the Linked Sites and any materials posted thereon, irrespective of whether such damages were foreseeable or arise in contract, tort, equity, restitution, by statute, at common law or otherwise. This does not affect Danny Thomas Coaching Academy’s liability for death or personal injury arising from its negligence, fraudulent misrepresentation, misrepresentation as to a fundamental matter or any other liability which cannot be excluded or limited under applicable law. Except where expressly stated to the contrary all persons (including their names and images), third party trade marks and content, services and/or locations featured on this Website are in no way associated, linked or affiliated with Danny Thomas Coaching Academy and you should not rely on the existence of such a connection or affiliation. Any trade marks/names featured on this Website are owned by the respective trade mark owners. Where a trade mark or brand name is referred to it is used solely to describe or identify the products and services and is in no way an assertion that such products or services are endorsed by or connected to Danny Thomas Coaching Academy. You agree to indemnify, defend and hold harmless Danny Thomas Coaching Academy, its directors, officers, employees, consultants, agents, and affiliates, from any and all third party claims, liability, damages and/or costs (including, but not limited to, legal fees) arising from your use this Website or your breach of the Terms of Service. Danny Thomas Coaching Academy.co.uk shall have the right in its absolute discretion at any time and without notice to amend, remove or vary the Services and/or any page of this Website. The above Terms of Service constitute the entire agreement of the parties and supersede any and all preceding and contemporaneous agreements between you and Danny Thomas Coaching Academy. Any waiver of any provision of the Terms of Service will be effective only if in writing and signed by a Director of Danny Thomas Coaching Academy. The Danny Thomas Coaching Academy believe that children flourish in a well-structured environment, where all children know what is expected of them. All children should be free to attend and enjoy all our sport sessions without fear of being hurt or bullied. Therefore, our objective is to create an environment which encourages self-discipline and self-esteem in an atmosphere of mutual respect and where all children have the ability to appreciate the needs of others. • Consistent and firm, but fair and kind. • The Behaviour Values and this Policy will be published on our website and form part of a parental commitment to support us with this policy when placing their children with us at any of our sessions. • The Behaviour Values will be regularly discussed with the children. • They will be explained to all newcomers (staff and children). All Danny Thomas Coaching Academy staff will be a positive role model for children with regard to the adherence to The Behaviour Values, they will resolve conflict calmly and with a courteous demeanour. Positive behaviour will be praised wherever possible, and the situation where a child only receives attention for unacceptable behaviour should be avoided. • Neither physical punishments nor the threat of physical punishments will ever be used. • These include shaking, smacking, pushing, pulling etc. • Children will never be sent out of the coaching area alone. • The humiliation of children is unacceptable. • Children will first be told that such behaviour (bad language, activities causing possible danger etc.) is unacceptable. • They will have the reasons explained to them. • Children are expected to apologise for hurting or upsetting another person, even if it was an accident. • It will always be made clear to the child that it is the behaviour that is unwelcome, not the child. • Staff will never shout, except to warn of a danger. • Staff will make themselves aware of and respect a range of cultural expectations regarding interpersonal interactions. • Staff will deal with inappropriate behaviour in a way that encourages the child’s development in a positive way. • Recurring problems will be tackled by a variety of means, using positive reinforcement, rewards for good behaviour, such as chart Team rewards etc. • Recurring problems will be tackled in partnership with the family and the whole club, possibly resulting in a short-term suspension in order to discuss the situation. • At this point the situation will be discussed with the parent or carer and a mutually acceptable solution found. Permission for targeted observations may be sought. • Every effort will be made to help the child adjust his/ her behaviour. • Should problems persist, unbiased observation records may be kept and countersigned by a witness. Parents will have access to these records. • A review of the observation records will be held, the family may attend but results outlining any support or strategy we can offer will be outlined. • Hopefully, as a result of this some improvement will be noticed and noted. • Should there still be problems, suspension may will be deemed necessary, and will be written on an incident form. • Parents should note that refunds will not be given in such cases, that should they wish the place to be held during the exclusion, it must be paid for. • The child will be allowed to return if he/she shows willing to alter their behaviour. • Their return is on a trial basis. • Should any incidents occur during this time, exclusion will be immediate and permanent. • Should a child need to be suspended twice, there will be no offer of return. Suspension is a last resort and should be avoided, but the safety of the group is paramount. Staff will be made aware through induction, training, our mentoring support, appraisals etc that some kinds of inappropriate behaviour may be the result of a child’s Special Needs or environmental circumstances, this will be taken into account with discussions with parents and carers. Reviewed by S Smith January 2016. Completed. Reviewed by S Smith January 2017. Completed. Mid-term review August 2017. Behaviour Policy added. Completed. Reviewed by S Smith January 2018. Completed.